Most attorneys require you to make an appointment in order to get some of the information that we have provided in our FREE books. We believe that you should be able to have this information when you need it without any pressure. Frankly, this method of talking to you also saves us time. We've packed a ton of information into this book and it saves us the hours of time that it would take each day just to talk to all of the new potential clients who call. So, rather than cut you short on the phone, writing these books gives us a chance to tell you what you need to know so that you can make an informed decision about what steps to take with your legal situation. Even if we do not accept your case, we would like you to be educated about the process so that you don't make a costly mistake. Should I provide a recorded statement to the insurance adjustor? Should I sign the forms sent to me by the insurance adjustor? What damages should my family and I receive for the death of a loved one? Is a contingency fee right for your case? Is it a good idea to have an attorney refer me to a doctor? How will I know if the offer from the insurance company is fair? For the answers to these questions, the 10 Myths About Car Accident Claims, 5 Things to Know Before Hiring an Attorney and much, much more order our FREE book to learn your rights and responsibilities. Why offer a Free Book? Because since 1975 our office has represented hundreds of injured Iowans including many families of Iowans killed in car accidents. We have seen too many clients make mistakes before they had the "right" information resulting in them losing thousands of dollars. Finally, you can learn about car accident injuries in the comfort of your own home with no risk or obligation. Request your copy of our book now while supplies last. Simply provide us with your name, address, etc. below or call our office at 515-216-4636. When you receive your book, you will also receive reports from real past clients and attorneys giving you their opinions about us, BONUS DVD's, and more. Don't miss out on all the valuable information about how to protect yourself after an injury. 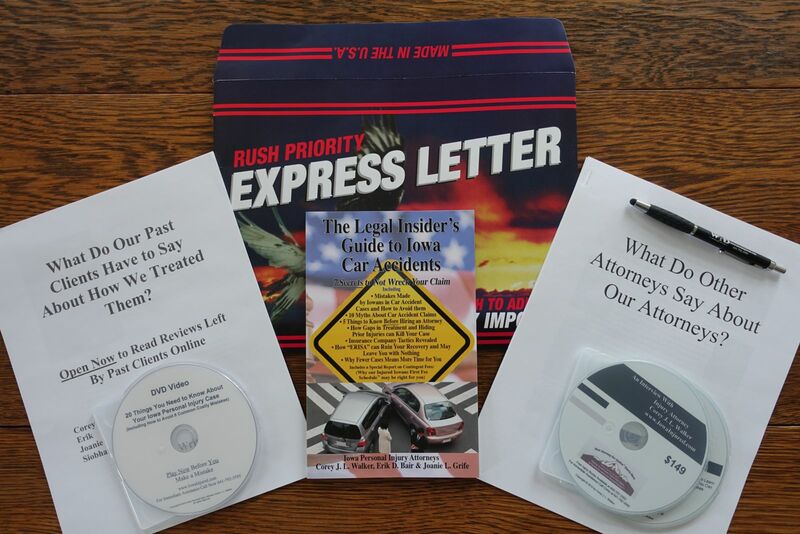 Our Guarantee to You: We are so confident that our book will help educate you that if you have an Iowa injury case and do not learn at least one thing, let us know and we will donate $1,000 to your charity of choice.